If you're an iOS or Android gamer, then you're already familiar with OpenFeint. It is the social gaming network through which you publicly humiliate your friends, and test your skills against the 75 million OpenFeint users. But GREE, the social gaming giant of Japan, has acquired OpenFeint for US$104 million. GREE has about 25 million users in Japan, bringing their new global total to 100 million users. The first concern, especially considering the looming AT&T/T-Mobile monopoly, is that such a service would stifle competition. At the risk of sounding unpatriotic, we don't mind a monopoly on social gaming, so long as it simplifies our bragging-rights experience. The avid OpenFeint customer might be concerned about a change in ownership. But GREE says that OpenFeint's leadership will remain, including their founder/CEO Jason Citron. And "long-term incentives" should keep their A-team aboard. 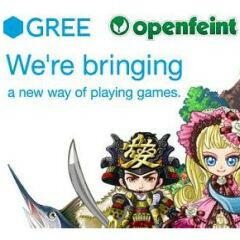 The combined force of GREE and OpenFeint will make a global social gaming network. They are already working on opening offices in Beijing, Singapore, and London. So soon, we will be able to compete on a truly global scale.